But even with the Pro as a successful template for how to build out the Surface family, Microsoft has one product that doesn’t really fit in with the rest, and that is the Surface Laptop. There are no tricks or unique chassis features here. 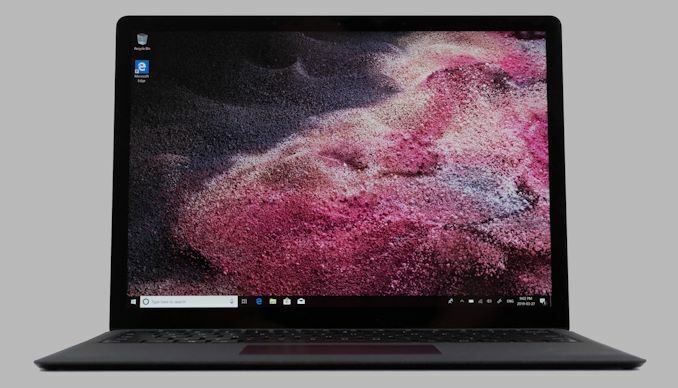 Microsoft just set out to create a thin and light laptop to fill a void where people want to buy a Surface, but want to use it in their lap; and they don’t need the performance, heft, or price of the Surface Book. It's a simple concept for a company that's been more focused on distinctive designs, but one that helps tap an important segment of the notebook market. Yet even with all of the Surface Laptop 2's cutting-edge hardware, what you surprisingly won't find here is a USB Type-C port. In fact it’s a bit ironic; Microsoft first launched the Surface brand because they felt the competition wasn’t innovating quickly enough, only for Microsoft to adopt USB Type-C at such a slow pace. As a result of this, the Surface Laptop 2 offers just a single USB port, and that is USB-A. While you can’t fault Microsoft for including a Type-A port (since it improves compatibility dramatically), the lack of any USB-C is a fault that is difficult to overlook, especially when you consider the laptop has a Mini DisplayPort instead, a port that has been rendered all but redundant by USB Type-C alt modes. I hope you're right. Intel has been caught sleeping, and the improvements since SkyLake have been, frankly, anecdotal. It seems that AMD, by making a small core, designed from the ground up to work in tandem with other cores, has a much more effective/scalable architecture. So a 4-core, 8-thread CPU from AMD, while providing slightly lower IPC, today, is much more effective than a 4-core, 8-thread CPU from Intel. "So a 4-core, 8-thread CPU from AMD, while providing slightly lower IPC, today, is much more effective than a 4-core, 8-thread CPU from Intel." I thought AMD currently has lower IPC + lower clock speeds so how exactly are they more effective? I'm assuming he meant in terms of price/core, but that's just a guess. Supposedly in idle only, but I do not really see that on my Matebook. Then again, I do not let it sit idling for hours on battery since it boots so quickly that there is no reason for that. In normal use (web / video), the battery indicator does not move much at all. Their big problem was definitely low power states management on the 2X00u series of chips. The 3x00 series chips that are now hitting the market make up a lot of ground in that regard, both with the chips themselves and better bios/uefi implementations by the vendors that are building the systems. Add in the fact that AMD has finally decided to take the lead on providing a stable, performant drivers for the video section of the chips, and you can largely ignore the abysmal efforts of the vendors themselves to provide quality, updated drivers themselves. For the money, some of the low end AMD 2x00u series laptops gave you MUCH more bang for your buck than the equivalent intel based offerings. The few limitations that people who purchased them did come across could be overcome through software tools by those that it actually mattered to (power and performance management profiles could be tweaked by certain software tools that allowed systems to maintain higher boost states longer and better manage their thermals). IPC includes the whole chip performance so they are still behind. From what I've seen a 6C/12T Intel beats a similar spec AMD easily. I've read that AMD's HT gives a bigger boost than Intel's but that still isn't enough for it to catch up due to it being too far behind in other areas. So it's about as meaningful in the real world as a purely synthetic benchmark.